In 1940, surrealist artist Leonora Carrington suffered a psychotic breakdown. She was in her early twenties, and her partner, celebrated master of Surrealism Max Ernst, was just taken from her at rifle-point and sent away to a concentration camp. Carrying his papers, she aimed to flee Nazi Europe but ended up instead at a mental institution in Spain. In the shadows of a continent splitting apart at its borders, Carrington too felt “jammed” and torn in two, forced to face the void that lurks beneath an ever-widening emotional and political rift. The short autobiographical novella Down Below chronicles Carrington’s painful episode in a series of diary entries dated three years after her breakdown. It is not an easy or particularly enjoyable read but one of great importance, not simply in the realm of art history but in the world of mental illness as well. Arthur Rimbaud believed that a “total derangement” of the senses would lead to a true surrealistic breakthrough. And while bird-headed monsters and long-legged elephants suggest a derangement of sight, one could argue that most of Surrealism is simply a visionary scramble, that these painters and sculptors are four senses short of Rimbaud’s ideal madness. One could also argue that Carrington achieved full-body surreality when Ernst was taken from her — that she actually achieved Rimbaud’s theoretical state — and it’s remarkable to see in Down Below how difficult the experience is and how lacking it is in traditional artistry. Rimbaud’s “total derangement” is a bitter, tortured nightmare, and Carrington shows how helpless one can feel after being knocked, wholly, into the realm of the unreal. Down Below is a devastating spiral of paranoia and blur, full of uncomfortably suspicious faces that drift through Carrington’s life and hospital room. Characters are difficult to keep track of, and while Carrington attempts, with troubling clarity, to reflect sensibly on her experiences it’s nearly impossible to make sense of things with her, despite her calm, clear narrative and occasional illustrations. While Carrington tries to think broadly about her existence and see how she fits into “other people’s [solar] systems,” it’s important remember that her collapse began with the abduction of her partner. Looking past the horrors of World War II, Carrington could potentially have been disarmed by autonomy, by freedom, by the absence of her much-older, father-figure of a lover. Perhaps, with her left eye, she needed to peer into the microscope within and reconcile the woman there, left alone. Carrington was an exceptionally talented and important artist and has only recently resurfaced as a major feminist force in the surrealist art movement. 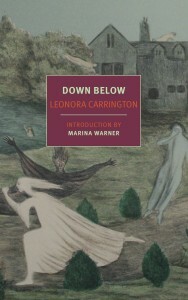 Marina Warner provides a masterful and personal introduction to Carrington and Down Below in this edition, which will inspire readers to not only find monographs of her spooky fantasias but also seek out the other recently published editions of her short fiction. 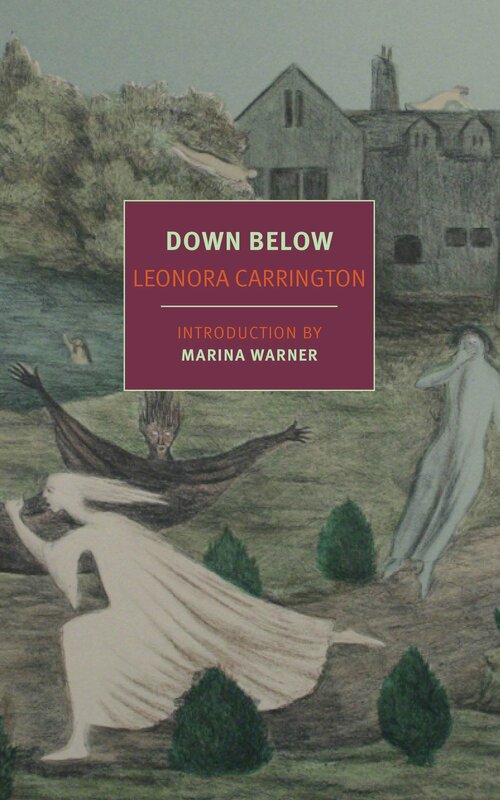 While Down Below is about, in part, the difficulty of facing buried memories, it’s of the utmost importance that we remember Leonora Carrington and keep her in the canon.